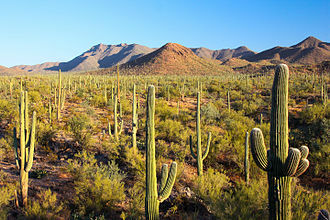 The highway runs through the cities of Casa Grande and Marana. 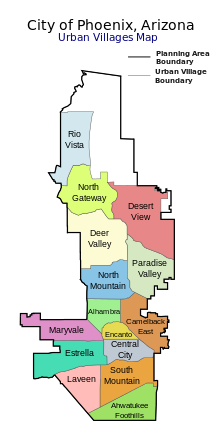 Segments of the highway are referred to as either the Papago Freeway, Inner Loop, or Maricopa Freeway within the Phoenix area, the western terminus is located at the California border at the Colorado River in La Paz County where I-10 continues westward into California towards Los Angeles. Here, the physical road is signed as both I‑10 and U. S. Route 95. 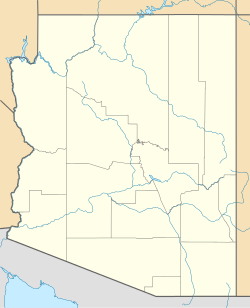 The highway runs east by northeast past Ehrenberg and Quartzsite and turns to an east by southeast orientation just before the junction for US60 and it continues this path entering Maricopa County and the Phoenix Metro area. 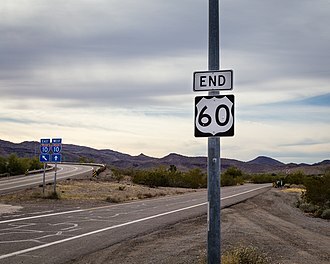 The route turns east by northeast again at the junction for State Route 85 northwest of downtown Buckeye, the speed limit drops from 75 miles per hour to 65. 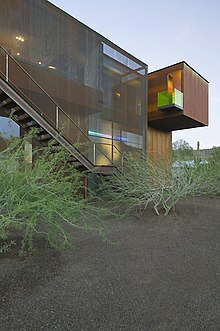 The landscape by this point is largely urban, from there, I-10 traverses through the communities of Goodyear and Tolleson, meeting with local streets and area freeways such as the Agua Fria Freeway along the way. 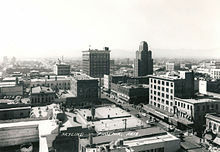 As it makes its way through Phoenix, the highway meets with I‑17, east of The Stack, I-10 forms the north edge of downtown. Near 3rd Avenue, the highway enters a tunnel that runs under a park. Emerging past 3rd Street, the highway continues due eastward for another 2 miles before coming to another interchange for Route 51 and Loop 202, at this interchange, I‑10 turns southward for about 3 miles, passing near Sky Harbor Airport and reaching the second junction with I‑17/US60. Here, I‑17 terminates as I‑10 skews eastward again, after this junction, the highway is co-signed with US60. Continuing southeast over the Salt River and eastward, I‑10 and US60 enter Tempe, then, at the Broadway Curve, the freeway turns southward again, with US60 splitting off to become its own freeway. 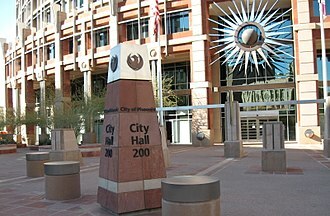 I‑10 continues southward running along the city borders of Phoenix on the west, and Tempe, Tempe again, immediately north of the Gila River Indian Community, I‑10 has its second intersection with Loop 202. Past Loop 202, the turns to a more south by southeast direction going through the Gila River Indian Community. 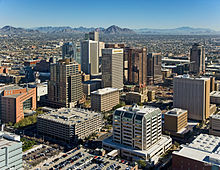 The Chase Tower in Phoenix, Arizona, is the tallest building in the state of Arizona. Built in 1972, it is 483 feet tall and it was originally built for local financial heavyweight Valley National Bank, which Bank One merged with in 1993. 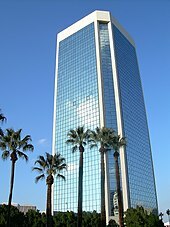 Bank One merged with Chase in 2005, and the building was renamed in December 2005 and it is 40 stories tall, but the highest occupiable floor is the 38th. There is no longer a public area on the 39th floor in the Chase Tower, it was closed during redevelopment. The tower takes up a city block. 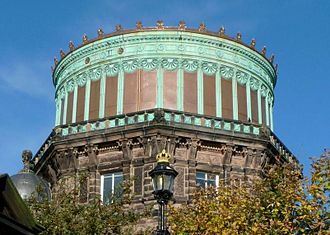 The footprint is similar to a 3 leaf clover and its stem, the stem is the narrow elevator core on the southern facade. It has a rough, concrete texture and is the tallest portion of the tower, the remaining exterior is a glass panel curtain wall. The west leaf, or wing, stand at 34 floors followed by the wing at 38 floors. 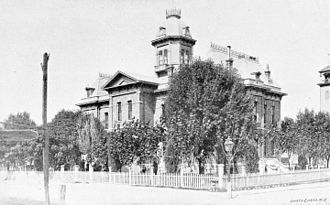 The building was designed by the prominent Los Angeles architectural firm Welton Becket and Associates, with associate architects Guirey, Srnka. 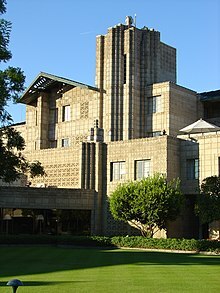 Located at 201 North Central Avenue, the tower was renovated in 2003 to accommodate 800 additional Bank One employees, in March 2007, Chase Tower was sold for record $166.9 million, the highest price paid for an office building in Phoenix. 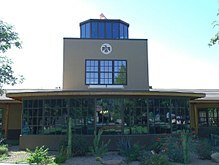 Arizona Science Center is focused on inspiring and engaging curious minds through science. 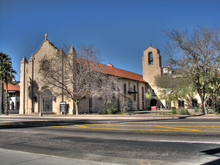 The Center is located in Heritage and Science Park in the heart of downtown Phoenix, Home to over 350 permanent hands-on exhibits, the Center is able to provide their 400,000 annual visitors with interactive experiences. 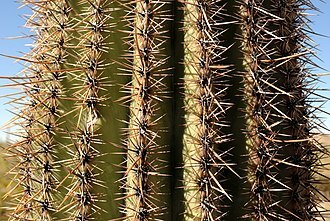 Aside from the permanent exhibitions, Arizona Science Center has featured a number of traveling exhibitions. 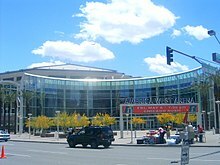 Along with daily demonstrations throughout the Center, the Center provides shows in the Dorrance Planetarium and in the new, five-story, Arizona Science Center, formerly the Arizona Museum of Science & Technology, was conceived in 1980 as a pilot science center by the Junior League of Phoenix. The Science Center’s first year of operation saw more than 87,000 visitors, some of the original hands-on exhibits are still found in the Center today. Construction of the 120, 000-square-foot, Antoine Predock-designed facility was completed in 1997, an additional $4.1 million City of Phoenix bond in 1998 added 22,500 square feet of much needed classroom and dedicated gallery space for traveling exhibitions. What began in 1984 as a small, storefront exhibition has today grown into one of the most successful attractions in the state of Arizona. Arizona Science Center has served more than three million patrons since opening its downtown Phoenix facility in 1997, many Hands Make a Home, Explores the materials, processes and knowledge necessary to build a home in Arizona’s unique environment. All About Me/The Wonder Center, Both mind and body are the subjects of this gallery devoted to human life, Learn about the physiology of moving, the mechanisms of healing, patterns of learning and remembering and new biotechnologies. My Digital World, An exhibition where one can learn more about the technology that ties us all together. Come in and do your name in Morse Code, the first digital method of communication, get Charged Up, Experiment with basic forces, electricity and magnetism. In the Fab Lab visitors can see demonstrations by visiting experts, daily Demonstrations, The Science Center’s education staff present free 15-20 minute demonstrations in the theater and stage areas throughout the day. 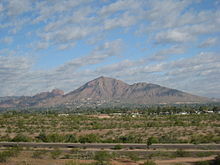 Arizona State Route 101, or Loop 101, is a semi-beltway encompassing much of the Phoenix Metropolitan Area in the United States. 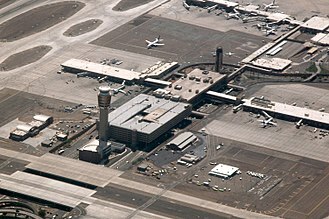 It connects several suburbs of Phoenix, including Tolleson, Peoria, Mesa, construction began in the late-1980s and was completed in 2001. Additional general purpose lanes and a high occupancy vehicle lane are being constructed along the stretch of Loop 101 from Scottsdale to Chandler. Loop 101 has interchanges with almost all area freeways, Loop 202, US60, SR51, Interstate 17, from that point, it heads north entering Phoenix Glendale, passing the University of Phoenix Stadium and Gila River Arena. Continuing northward through Peoria, it passes the Peoria Sports Complex before entering northwestern Glendale, Loop 101 now heads eastward on the Beardsley Road alignment. 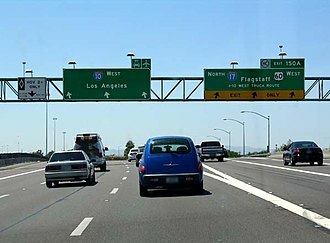 The freeway enters northern Phoenix, and at milepost 23, Loop 101 intersects Interstate 17 near the Deer Valley Airport,15 miles north of Downtown Phoenix. Continuing east as the Pima Freeway, it passes through the Union Hills area, east of its junction with Route 51, Loop 101 curves south through Scottsdale in the northeast valley on the Pima Road alignment. Continuing south, Loop 101 encounters an interchange with the Red Mountain Freeway portion of Loop 202 in Tempe at milepost 51 and this interchange is partially built over the Salt River. After this interchange, Loop 101 is now the Price Freeway, Loop 101 provides access to Chandler Fashion Center just prior to concluding at milepost 61 at an interchange with the Santan Freeway portion of Loop 202. The highway originally was assigned two different route numbers along its path, the Agua Fria Freeway portion was initially designated SR417, the section along the Pima/Price Freeways was to be SR117. 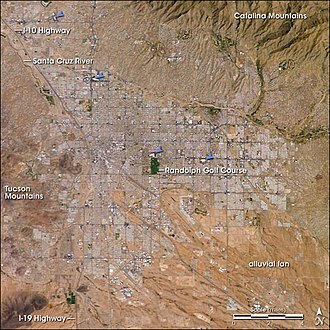 A portion of Loop 101 between the Superstition Freeway and McDowell Road near Scottsdale had been proposed as the Indian Bend Freeway in 1962, in 1991, the proposed South Mountain Freeway was renumbered as part of Loop 202. The San Tan Freeway portion of Loop 101 has never officially been renumbered, an exit in Northeast Phoenix at 64th Street started construction in January 2008, and completed construction in the end of Q32008. The Gila River is a 649-mile tributary of the Colorado River flowing through New Mexico and Arizona in the United States. 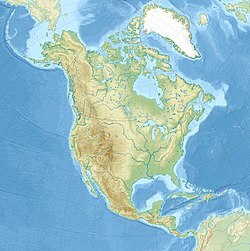 The river drains a watershed of nearly 60,000 square miles that lies mainly within the U. S. but extends into northern Sonora. 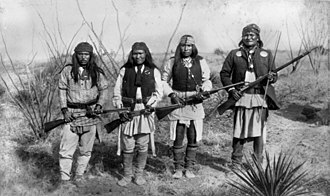 Indigenous peoples have lived along the river for at least 2,000 years, Euro-Americans did not permanently settle the Gila River watershed until the mid-19th century. The historic natural discharge of the river is around 1900 cfs and these engineering projects have transformed much of the river valley and its surrounds from arid desert to irrigated land, and supply water to over five million people that live in the watershed. The Gila River has its source in western New Mexico, in Sierra County on the slopes of Continental Divide in the Black Range. 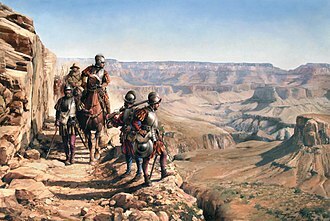 It flows southwest through the Gila National Forest and the Gila Cliff Dwellings National Monument, westward into Arizona, past the town of Safford. After flowing along the slope of the Gila Mountains in Graham County through a series of canyons. 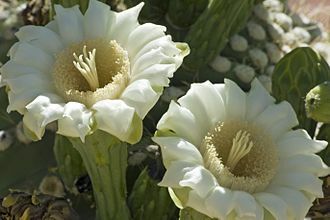 It emerges from the mountains into the valley southeast of Phoenix, well west of Phoenix, the river bends sharply southward along the Gila Bend Mountains, it swings westward again near the town of Gila Bend. 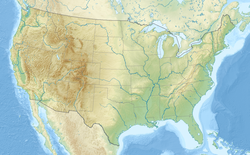 It flows southwestward between the Gila Mountains to the south and the Languna and Muggins ranges to the north in Yuma County, and finally it empties into the Colorado at Yuma, Arizona. The Gila is joined by tributaries, beginning with the East and West Forks of the river. Above Safford, it is joined by the San Francisco River, further downstream it is joined by the San Carlos River from the north in San Carlos Lake. 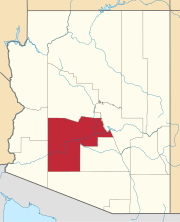 At Winkelman, Arizona it picks up the San Pedro River, the Salt River, its main tributary, joins in the Phoenix metro area, and further west the Gila receives its last two major tributaries, the Agua Fria and Hassayampa Rivers, from the north. 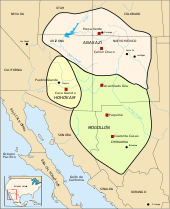 Although the Gila River flows entirely within the United States, the headwaters of two tributaries – the San Pedro and Santa Cruz Rivers – extend into Mexico, about 1,630 sq mi, or 2. The Cross Cut Canal dam and forebay are within Papago Park, by the Crosscut Canal Multi-use Path. The building under construction in 1972. The Piestewa Freeway at its southern terminus, the "mini-stack" with Interstate 10 and Loop 202. Photo looks north as SR 51 winds through residential areas and the Phoenix Mountain Preserve. The Phoenix inset from an early plan for the Interstate Highway System showing what would become the Piestewa Freeway as a spur from what would become Interstate 10. Southern terminus of SR 143.